Obituary for Sylvia L. (Boffi) Pietrantozzi | Nardolillo Funeral Home, Inc.
79, of Johnston, passed away peacefully, surrounded by her family on Monday, November 5, 2018, at Our Lady of Fatima Hospital, North Providence. She was the beloved wife of fifty-six years to Emilio A. Pietrantozzi. Born in Providence, she was the daughter of the late Mulfino “Bucky” and Letizia “Lettie” (Germani) Boffi. Sylvia was a jewelry assembler for the former Ferro Novelty Company of Providence for several years. 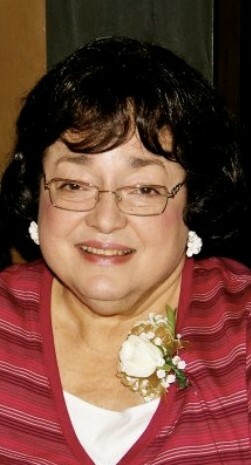 She enjoyed spending time with her family especially her grandchildren and attending their sporting events. Besides her husband she is survived by her loving sons Anthony E. Pietrantozzi and his wife Mary of Scituate, and Steven P. Pietrantozzi and his wife Lynn of North Kingstown. Sylvia was the cherished grandmother of Lauren, Steven, Nicholas, Emily, and Rachael. She was the sister of Richard Boffi and his wife Gayle of North Kingstown. Funeral from the NARDOLILLO FUNERAL HOME & Crematory, 1278 Park Avenue, Cranston on Tuesday at 9:00 a.m. followed by a Mass of Christian Burial at 10:00 a.m. in St. Robert Bellarmine Church, 1804 Atwood Avenue, Johnston. Burial will be in Rhode Island Veterans Memorial Cemetery, Exeter. VISITING HOURS Monday 4-7 p.m. In lieu of flowers, memorial contributions may be made to St. Robert Bellarmine Food Shelf, 1804 Atwood Avenue, Johnston, RI 02919.